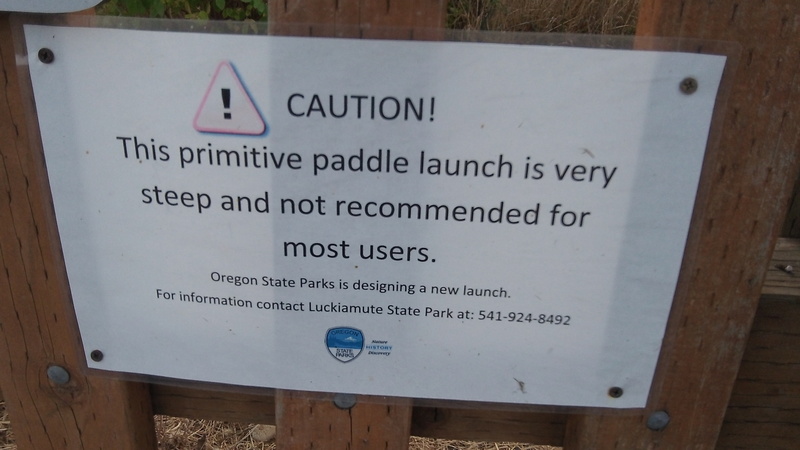 This was the sign at the Luckiamute paddlers’ access that made a reader wonder. A reader found a new sign at the Luckiamute state park in Polk County and feared it meant that the improved and much-delayed launch for paddle craft had sunk for good. As it happens, the paddlers’ access concept is stalled but still afloat. The dry-land features of this launching point, complete with signage, parking spaces and an outhouse, were built a couple of years ago on the west side of Buena Vista Road. As I’ve reported, you can get your canoe or kayak in there, but to do so you practically have to throw it down the Luckiamute’s steep bank. An improved launch was to be built in 2013 but delayed by permit requirements. It was postponed again in 2014 and this year as well. Prompted by Birdsong’s question, I emailed Dennis Wiley, an executive in the state parks department. “At this point we still plan to improve the access,” he replied on Aug. 24. “We have had a change in engineers for the project as well as park manager. We are meeting in September to get the project moving forward again.” So there appears to be hope. And the new park manager is Dennis Lucas, working out of Willamette Mission State Park.